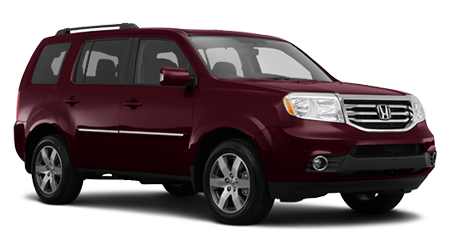 If you're looking for a rugged, full-size SUV with seating for up to 8, then look no further than the 2015 Nissan Armada. This grand SUV will seat up to 8 comfortably in its well-appointed cabin and still have cargo space to boot. Wallace Nissan in Stuart, FL, serving Port St. Lucie, Palm City, White City, and Jupiter, FL, invites you and your family down to our dealership to take the 2015 Armada for a spin. When you see what it has to offer, we know you and your brood will be driving home in one! Let's see how the 2015 Nissan Armada compares to the Honda Pilot. Given that the base Nissan Armada SV is priced a bit higher than the Honda Pilot, we're taking a look at a comparably priced 4x2 Pilot EX-L as far as standard features go. The base Armada includes such standard features as 18-inch silver alloys, heated power mirrors (not available on the Pilot) and standard running boards. Inside the elegant cabin you'll enjoy power-adjustable pedals, a fold-flat front passenger seat and center armrest to fit super-long cargo, and a handy 40-20-40 split folding rear bench, and rear parking sensors -- all features not available in the Pilot. You'll also get an 8-speaker audio system (7-speakers on the Pilot), Bluetooth, and a 7-inch vehicle information color monitor. To power this behemoth, you need a big engine with a lot of horsepower and torque, and the 2015 Armada has just that. Under the hood is a 5.6L DOHC V8 with 317hp and a massive 385 pounds per foot of torque. It's coupled with a 5-speed automatic transmission and comes with optional AWD. By contrast, the Pilot gets a 3.5L V6 SOHC with only 250hp and 253 pounds/ft. of torque. The Armada is a heavier vehicle with a curb weight of 5,267 vs. the Pilot's 4,365 which is probably why there's such a discrepancy in engine size. But the hefty 2015 Armada really flies and will get you where you need to go with ease. It's also a very capable off-roader, while the Pilot lacks grit in that department. 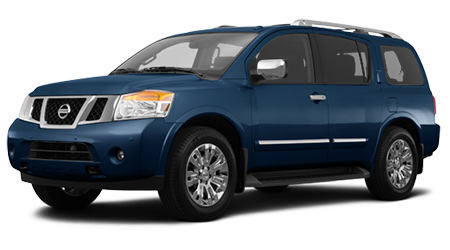 The 2015 Nissan Armada will keep your passengers more comfortable than the Honda Pilot. With all seats upright and passengers inside, you'll get 20 cubic feet of cargo space behind the 3rd-row seat in the Armada while you'll only achieve 18 cubic feet in the Pilot. Maximum cargo volume with seats folded down reaches 97.1 cubic feet in the Armada, compared to 10-inches less in the Pilot at 87 cubic feet. Plus, front passengers can stretch out better in the Armada, with 41 inches of headroom and 41.8 inches of legroom for the front passengers, while the Pilot can only offer 39.3 inches of headroom and 41.4 inches of legroom.